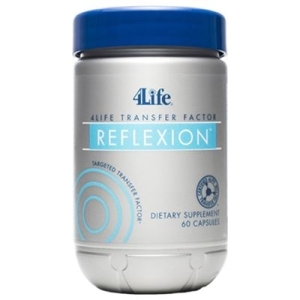 4Life Transfer Factor Reflexion™ is tailored for busy individuals who wish to improve their overall mood, cognitive focus, and ability to cope with stress in daily life. The proprietary blend of natural ingredients, including L-Theanine and wild green oat (Avena sativa), supports brain processes and circulatory system function. 4Life Transfer Factor Reflexion promotes healthy physiological responses to occasional stress, including blood pressure and heart rate. 4Life Transfer Factor Reflexion™ is protected by U.S. patents 6,468,534 (extraction process for transfer factors from chicken egg yolk) and 6,866,868 (exclusive combination techniques for transfer factors from cow colostrum and chicken egg yolk).